The words we use create the world we see. All knowledge is intricately tied to language. With the extinction of a language, no matter how insignificant that language may seem, comes an incalculable loss of knowledge. Language lights the world of our species. Extinctions turn out those lights. And just as fauna need continuity in their habitats, so too do humans need continuity in their knowledge of the world. If enough lights are extinguished, we become isolated. Isolation, inevitably, leads to extinction. 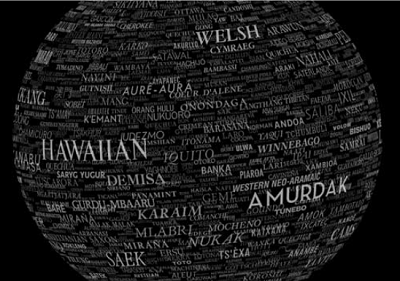 Over 7000 languages are spoken on planet Earth. 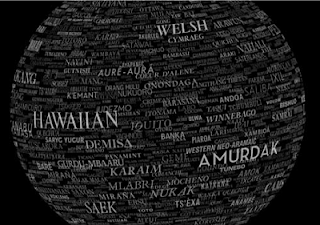 Ethnologue puts the number at 7099; and goes on to state that a third of those languages are endangered. Just 23 languages account for half the world's population. 86% of the world's population use an Asian or European language. In the next several generations half the known languages will be extinct. Bob Holman, a poet, who cobbled together a film called 'Language Matters', has labeled Chinese, English, and Spanish as bully languages. These bullies, with their dominant economic position, are forcing out other tongues. These three toughs are taught in schools and mandated by government to the exclusion of local voices. According to the National Geographics, every two weeks another language dies. In the Pacific Northwest, only ten speakers of South Haida remain. In Oklahoma, only five speakers of Zaparo exist. Uru, Vilela, Xiri, all South American languages, are at risk. In Mongolia, Eastern Siberia, and Northern Australia the lights continue to dim and flicker. Does it really matter? We have five (some say six) senses. Hearing words is just one part of who we are. Won't homo sapiens find the means to compensate the losses? Over the next few weeks, CwHD will consider the cost of language extinction.